Nicole "Nikki" Bronner Serves all of CNY! As an agent, Nikki prides herself on living with a POSITIVE MINDSET & creates this atmosphere within her Team and her clients. If you DECIDE, COMMIT, FOCUS and BELIEVE, YOU WILL ACHIEVE! Nikki uses certain "Tools" in every aspect of her life. SUCCESS NO MATTER WHAT YOUR GOALS ARE! "YES YOU CAN" - A PURCHASE OF A NEW HOME AND/OR EQUITY RETURN ON A SALE OF YOUR CURRENT HOME is a DREAM that CAN come true! "IF YOU BELIEVE, YOU WILL ACHIEVE"! With the CNY BELIEVE & ACHIEVE TEAM, we take a different approach to Real Estate, one that is built on PERSONAL touches, WIN-WIN deals and POSITIVE results. Our Team utilizes our network, the latest technologies, market research and business strategies to EXCEED your EXPECTATIONS. More importantly, we LISTEN and that means we find SOLUTIONS that are tailored to you. 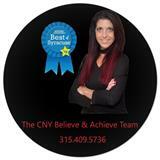 Thanks for starting your Real Estate search with Nikki & the CNY Believe & Achieve Team at The Sripa Group LLC. This website is full of Information, whether you are looking to BUY OR SELL! Nikki is always available to help, day or night! STRONG Negotiation Skills & Facilitation through the Contract to Close Process and BEYOND.